Made from a champagne bottle, this keepsake is a reminder to always celebrate with bouquets and bubbly. Made from an upcycled champagne bottle, this keepsake wedding vase is a reminder to always celebrate with bouquets and bubbly. The deep green glass is etched with a "label" that can be personalized with the couple's names, wedding date (or special anniversary number), and location for a timeless toast to the day they said I Do. Glass cut in the USA. Decorated in Reno, Nevada. 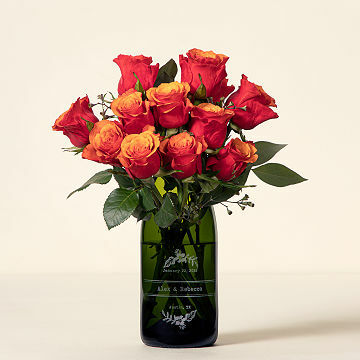 Also check out our Personalized Champagne Milestone Vase. Will be used to hold flowers during vows and while they eat. Festive and handsome appearance for permanent display. Personalized imprinting makes for a life-long remembrance and memento. Excellent product for any occasion. Great product, should be a little bit larger.